I decided to revisit the CBHT class. Firstly, I wanted to refactor the code to derive a common base class. Then, extending this class, I wanted to provide an alternative implementation that was sorted (using a 2-tier sort; first by key and then by value) and provided faster searches. 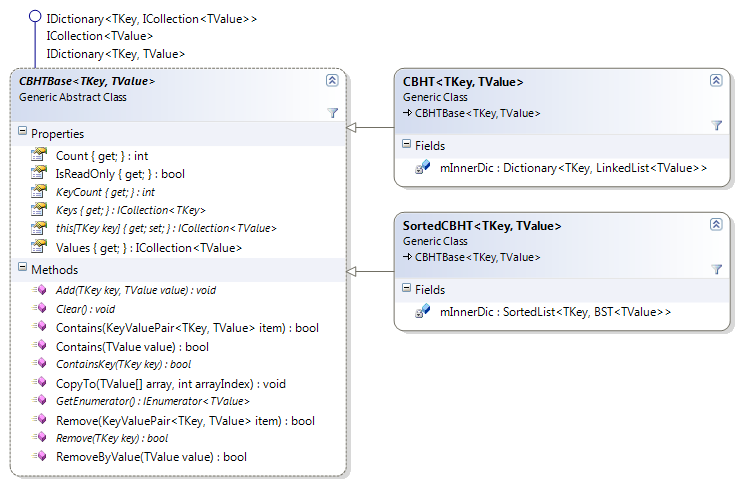 The sorted CBHT implementation must be based around two sorted types; one to represent the collection of buckets and one to represent the structure of the buckets themselves. For the bucket structure, I have a ready-made solution in the form of the generic BST class I wrote for the last post. It is implicitly sorted by value and searches faster than a linked list. Each of the two CBHT implementations has its strengths and weaknesses; the sorted version is much faster at searching, but slower at insertion. The unsorted version is faster at insertion and retrieval, but cannot be sorted and is much slower at searching. It is worthwhile to note that tests using large numbers of random keys and values showed that the bottleneck caused by searching in the unsorted version is greater than the performance defecit caused by insertion in the sorted version. Each therefore has its own use in future projects. Posted in Downloadable source code, Utility code.Tagged abstract classes, C#, collections, generics, refactoring, sorting.